Great Horned Owls are found almost everywhere in the United States, and are definitely found in Sutton. They come out at night which makes them hard to photograph :) However, you can hear them call! The second WHOO would be higher than the rest, and the final WHOOO would be a middle tone. Great horned owls eat ALL SMALL MAMMALS including cats and small dogs. If you have a cat or dog in Sutton, it's wise not to let it out at night. These birds have wingspans up to five feet long. They are large, strong birds. 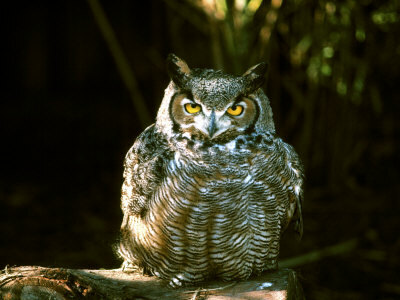 Here is a Great Horned Owl image from Art.com.